Making it Happen! is a show about taking empowered action in the face of overwhelming complexities, tremendous competition, and relentless change. Carol invites listeners who are--or aspire to be--in leadership roles and are not achieving the results they want in their career or life. 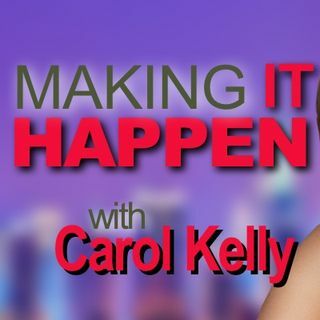 Carol also informs, inspires, and incites those listeners who need the courage and resilience to step up, create the change they want to see, and rise to the top of their game. Consider the possibilities of ... See More partnering with Carol each week to be empowered and recharged. Perhaps you want to get promoted, strengthen your team, or be more in control of some aspects of your personal life. Whatever your situation, Carol, in her passionate, high-energy, and engaging style, will stimulate you to have a positive shift in mindset and behavior. Be prepared to have your thinking challenged, emotions stirred, and spirit lifted! Making It Happen (17) STILETTO POWER: Critical Success Strategies for Women.